I have read quite a few of Sara Sheridan’s books and what I love about them is that she is writing women back into history. All too often women’s contributions to history are overlooked since many accounts were written by men and anything women did write was often not valued or retained. Sara Sheridan’s books are full of strong, feisty women bringing a different perspective to history. In The Ice Maiden she mixes fact with fiction to great effect. Karina is stranded on Deception Island in the South Atlantic following the death of her seafaring husband on a whaling expedition. She is desperate to return to her sister in Amsterdam and stows away on board a ship, dressed as a boy. However, she is horrified to discover that the ship is in fact heading for the Antarctic, one of the harshest environments in the known world. 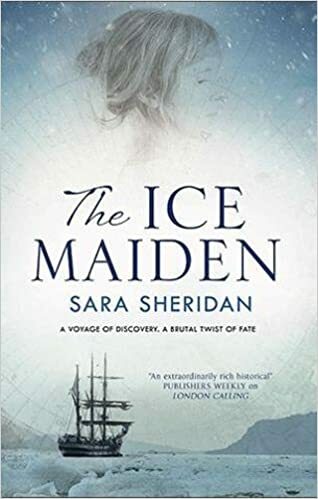 Though I was reading this during the continuing heatwave, Sara Sheridan certainly brought the cold of the Antarctic vividly to life. All the little details of life on board ship built up a clear picture of a sailor’s life in the 19th and 20th centuries. It must have been meticulously researched and yet the detail is never too much. Sara Sheridan’s passion for illuminating history shines through, bringing to life a time and way of life I knew little about. It was fascinating to read about how people survived in such harsh conditions. Karina was a terrific character to read about. She was a spirited, brave and passionate woman. She had been through so much that when love presented itself, she didn’t want to wait, perhaps rather unconventional for a woman of her time but then Karina was a rather extraordinary character. And my goodness she was a brilliant woman scorned! The story took an unexpected turn which certainly took me by surprise. Once I had got my head around what had happened, I settled back into the story with renewed interest. I did need to suspend disbelief a bit but the way the story unfolds makes this easy to do. It gave Karina – and the reader – a chance to find out and understand so much more about the significant people and places in her life. This different approach to telling the story also enabled Karina to have insight into one of the most famous Antarctic expeditions – the voyage of the Discovery with Scott and Shackleton on board. I’m particularly fascinated by Sir Ernest so loved this part of the story. I’ve visited the actual ship at Discovery Point in Dundee (photos below) so could easily imagine life on board. The Ice Maiden is a hugely enjoyable adventure story of love, betrayal, revenge and danger in the frozen south. Sara Sheridan is the author of the popular Mirabelle Bevan historical mystery series, as well as several historical novels. Fascinated by female history, she is a cultural commentator who appears regularly on TV and radio. In 2014, she was named one of the Saltire Society’s 365 Most Influential Scottish Women. She lives in Edinburgh. Oh! I didn’t know about this one. Off to investigate more! Not out till the end of the month but it’s on Netgalley if you’re not still on a self-imposed ban! I am! Will just have to wait! Love the review, I have this and I can’t wait to read it. Sounds a super read.